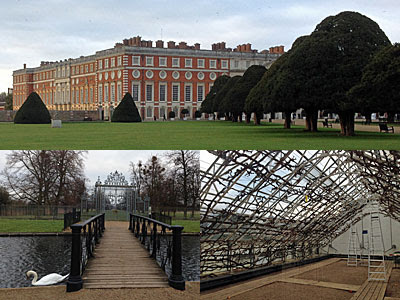 Hampton Court Palace is on the premier list of London's tourist destinations, the place to go for a history lesson you simply can't get abroad. It's also high on the "How much?!" list, demanding £15.50 per adult ticket, then requesting a 10% 'donation' on top. But there is a great deal to see both in and outside the palace, including that famous maze I told you about yesterday. And if you visit in January or the first half of February, and book online, you can get in for half price. Sorry, I wish I'd known earlier. "Here's your map of the palace, here's your map of the gardens, and here's your list of what's going on today." You shouldn't be at a loss for stuff to do, but you might miss some of it if you don't keep your eyes open. The palace is enormous, so is split up into half a dozen major sections plus a scattering of intermingled treats. Each suite of rooms is accessed off one of the three main courtyards, the largest being Base Court... which is also where you pick up your free audio guide. At this time of year you can also pick up a free cloak to keep you warm, so several visitors swish round looking appropriately 'period', and are occasionally mistaken for the official staff in their bright red uniforms. 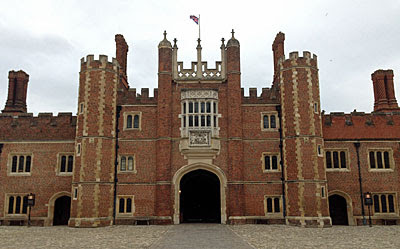 The top heritage experience ought to be King Henry VIII's Apartments, this within the oldest part of the palace, hence with panelled cubbyholes and tales of the occasional ghost. The Great Hall has a splendid and lofty hammerbeam roof, complete with a ring of wooden stags looking down, whilst elsewhere the atmosphere has to be boosted by a succession of Tudor portraits. At one point the tour threads around the balcony of the Chapel Royal, where Edward VI was christened, assuming there isn't a service on. I got a choir practice instead - quite charming - and later the opportunity to walk around at pew level. Close by are Henry VIII's Kitchens, because any set of rooms sounds more authentic with 'Henry VIII' plonked in front of it. These were bloody cold at the weekend, hence locating the one room with a roaring fireplace proved welcome. The stock decoration here appears to be pies, with umpteen identical 'pastries' scattered across the majority of surfaces. A lengthy track on the audio guide reveals piemaking to be a key method of Tudor canteen cuisine, that's if you get that far - I always seemed to be several steps ahead of whatever the voice in my ear was saying. But stick with it, because very little around the palace interior is fully labelled, so if you're not listening you're missing out. 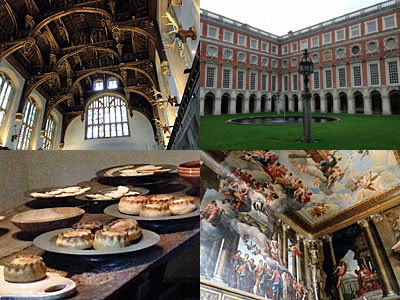 The best, by which I mean the most stately, part of the palace is William III's apartments. The King's Staircase is phenomenal in its own right, with its all-enveloping mural designed to wow those who came to court. Well-dressed members of the public were allowed into the next couple of rooms, a few even beyond the Privy Chamber to watch the king being formally dressed, but none reached the Great Bed Chamber, nor the suite of private rooms beyond. A separate trail through The Georgian Story is fractionally less impressive, but equally lengthy, with an informative potted history of Queen Caroline and a chance to see her royal four poster. Try not to push beyond the rope, it sets off a loud alarm, and then you'll have to pretend to be stupid to avoid a telling off. I've yet to mention Young Henry VIII's Story, a scant upstairs exhibition which hits directly on Wolf Hall territory and probably relies too much on highbacked chairs for display purposes. I haven't discussed the very-new Cumberland Art Gallery, an attraction within an attraction, with its Titian and a room full of ten Caravaggios watched over by a not terribly thrilled member of staff. I've glossed over Mantegna's Triumphs of Caesar, a lengthy mural from the turn of the 15th century, which everyone troops outside to see but not everyone thinks worth the effort. Nor the chocolate kitchen, back when that was a nobles-only luxury, nor The Baroque Story, with its 13 minute animated feature which explains how useful it was that William of Orange ran out of cash before upgrading the entire building. All that plus two gifts shops and a cafe. And then there's outside. The patch round the maze you can look round for nothing, but the remainder is watched over by a kiosk... unstaffed on Sunday afternoon, so you could have looked around everything for nothing. The formal gardens are most impressive, particularly the lines of topiary cones splayed out across the Great Fountain Garden. That wasn't gushing at the weekend, but the Long Water stretched off impossibly far towards Kingston, and a heron swooped down out of a tree just for me, so I was well chuffed. The Privy Garden is a recent upgrade, this leading down to heraldic gates by the Thames, and a favourite for visitors with selfie sticks to pose in front of a quintessentially British formal backdrop. Then comes the record breaker, the largest and possibly oldest vine in the world, planted around 250 years ago by Capability Brown. Don't come specially in February, it's just had its annual prune, but there are three weeks in September when its sweet dessert grapes are on sale in the Hampton Court shop. The half price ticket offer expires just before half term, because that's how these things work, but there's still one weekend left (and some hot kitchen banqueting action scheduled). At Easter the Palace starts its 500th birthday celebrations, with an expensive extended weekend of extra-special activities (including son et lumiere). Or just come some other time, even if you've been before - I'd left it eight years and was pleased to make my reacquaintance. But try to avoid the peak summer season if you can because, like so many of Greater London's treasures, they're always best with hardly anyone else around.